Boyana Church is renowned for its frescoes from 1259. They form a second layer over the paintings from the earlier centuries. In all, there are 240 depictions on the walls. Its painter is still anonymous, but stands for the team that decorated the church and that was trained in the studios of the Turnove Art School. A total of 18 scenes in the narthex depict the Life of St. Nicholas. The painter here drew certain aspects of contemporary lifestyle. In The Miracle at Sea the ship and the sailor's hats recall the Venetian fleet. Also most interesting are the full-size paintings of the donors, Kaloyan and Dessilsava, and of the Bulgarian King Konstantin Assen Tih and Queen Irina. Kaloyan holds a model of the church and presents it to St. Nicholas. 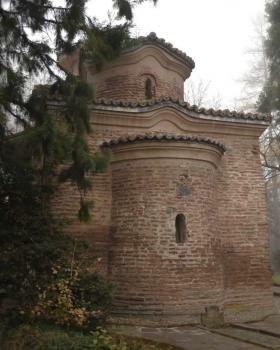 The architecture of Boyana Church dates from late 10th and early 11th century. It's the eastern part of the current building, which also sees additions from mid-13th century and mid-19th century. 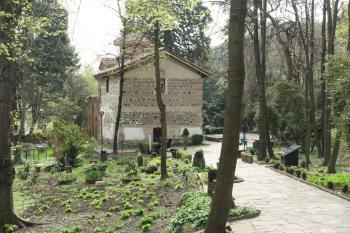 Boyana Church can be found in a residential neighbourhood on the outskirts of Sofia. My taxi-driver didn't know its location, but after asking some directions we safely arrived there. The little church is hidden in a lovely park. I had to wait there some time before I was able to buy a ticket, and later before I was allowed to get into the church (because of its small size, only small groups can go in at the same time). 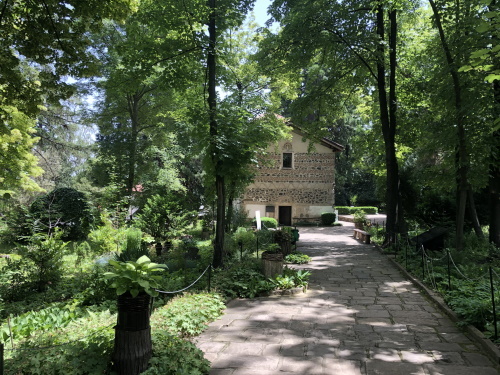 Boyana Church is in a quiet, upscale neighborhood on the outskirts of Sofia. It has three distinct eras of construction, from the 10th, 13th, and 19th centuries. The church was restored and maintained with the support of Queen Eleonora, whose grave is on the site. Inside, there are original frescoes, including one I particularily liked of St. Sofia. Visiting is easy, it's a quick (maybe 10-15 leva) taxi ride from almost anywhere in the city. In Boyana neighborhood is a movie studio, so if you want to try your luck at spotting American actors on a lunch break, head to the restaurant Cinnecitta nearby afterward. 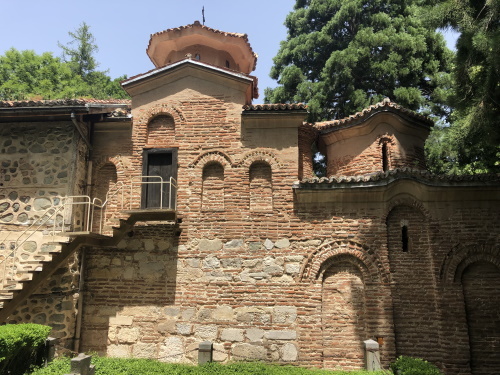 I have a full write-up here: UNESCO World Heritage Site: Boyana Church. On my last day in Sofia, I went to Boyana Church. It’s a small church with very nice frescos on the outskirts of Sofia facing the mountains. The original church built in the 10th century was extended repeatedly. Repeatedly new layers of frescos were added atop of the previous frescos. The key frescos of the church are from the 12th century. Interestingly, you can see the different layers at some spots in the church due to missing parts. The visit itself is rather quick. It’s a tiny site and I would be surprised if you spend more than 30min here. On my way up I took a tram (#4 or #5, same line you need to go to the bus stop for Rila). From the closest station I simply walked to the church (30min or so). On my way back I took bus #64, but I don’t think it takes you fully into town. Sofia isn’t a beauty, not even a sleeping one. It’s a bit surprising considering the long history of the city. I did appreciate the Roman ruins and the Sweta Sophia, an early Christian church (4th-5th century). Boyana Church itself is a good starting point for hiking into the mountains. You can follow the Boyana Cascades up, but it’s quite a climb and partially a very rough trail. Visited the Church on 30th May 2014. It's a 20 minute drive to get there from our hotel. We arrived early morning around 10 AM, got the tickets, and had to wait like a minute for like 3 people to get out the church. We are with two people and other 4 joined to go inside. We stayed probably quite long inside as it was very quiet. The church itself, outside, it's a soso. BUT the fresco's......best ones I have seen till today ! Seems I cannot add any photo's here so check my gallery on my blog. The church, as of August 2013, is fully restored and the scaffolding is down. 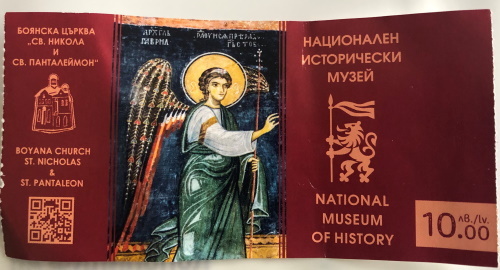 The inside is covered with 13th century frescoes, including a cycle of the life of St. Nicholas (later morphed into Santa Claus) as well as portraits of the ruling tsars and tsarinas of the times. Very well informed guides took groups of five to ten people at a time into the climate controlled church. The interior is small, basically a narrow apse and the nave, with an outer area that has an exhibit about the restoration work. The frescoes were some of the most beautiful and best preserved (and restored) I saw in Bulgaria. They approach in beauty and artistic sophistication those found in Italy of that period. Rebecca West wondered,(though she was talking about Yugoslavia but still relevant)how far could this painting have advanced but for the Turkish occupation. Compare these to the Russian Revival style paintings from the 18th century in Alexander Nevski and post-Ottoman churches (inferior, almost cartoonish in my non-expert opinion) to get an idea of the various forces that have shaped this part of the world. 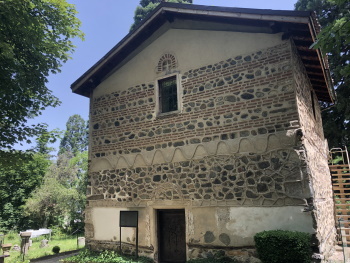 Boyana restored is certainly worth a visit. While you wait your turn to enter (the day I was there I only had to wait five minutes or so for the group before me to come out) you should walk around the grounds. The guide, who was also waiting for her turn to enter, spoke about the history of the church, answered questions about the exterior and talked about some of the graves (and their inhabitants)in the nearby cemetery. There are food stands and cafes in the car park just outside the church. Visited in June and the church was still closed for conservation apparently. Be careful in getting taxis from the train station. I thought I got a bargain on the way there, only to be charged half the price on the way back (different taxi)! Domes: "The oldest Boyana Church, the so-called East or First Church, was designed and used as a chapel. It had a typical Greek cross plan with a dome, and a concealed internal cross without free-standing support and without a narthex." Built in the 13th century: The church owes its world fame mainly to its frescoes from 1259. They form a second layer over the paintings from earlier centuries and represent one of the most complete and well-preserved monuments of Eastern European mediaeval art.